Red-winged Blackbird attacks are normal around my pond. Whenever a Great Blue Heron decides to descend upon the cattails to do its fishing, out comes an aggressive Red-winged blackbird ready to take him on as it pecks at it continuously. All the while the Great Blue continues to strut along until it finally takes off and flies to another section of the pond. I have seen this happen quite a few times in the last two weeks so I guess the heron is not ready to give up yet. I have also seen a Red-winged Blackbird dive-bombing a Red-tailed Hawk as it tries to close in on the blackbird’s territory. The blackbird will keep flying and pecking at the hawk, following it into the distance away from the area. I have not see the hawk come back but that is not the only hawk in the area so I am sure the Red-winged Blackbird is keeping pretty busy. Why is the Red-winged Blackbird doing this? The male or female is defending its active nesting territory. They have nestlings and do not want these predators taking their young for dinner. Red-winged Blackbirds breed in spring through mid summer having one or two broods per season. You may find several nests in one small area (about 1/4 acre or more) as the male is polygamous and will mate with a few females (can be up to ten) within its territory. 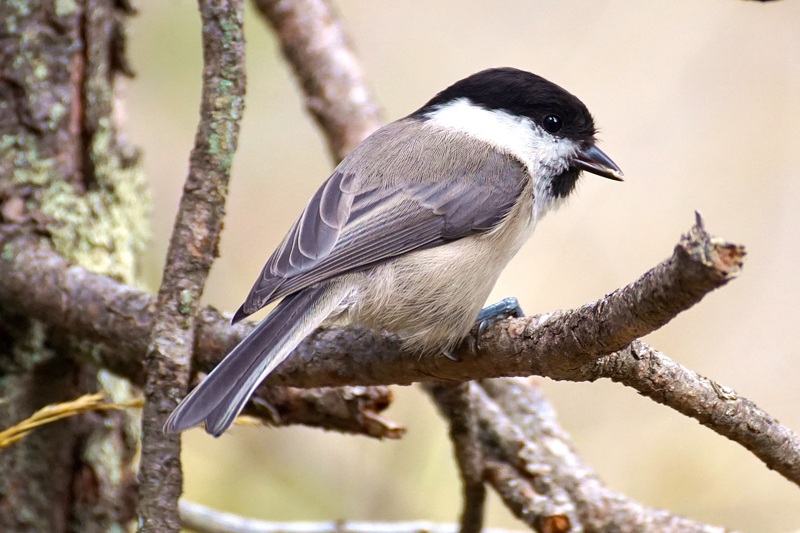 Their nests are cup-shaped and are made of grass that are lashed onto reeds or a small bush. The female will lay up to three or four eggs which takes up to twelve days to hatch. Once the eggs hatch it is another ten to fifteen days before the young leave the nest. Where Do They Nest: These blackbirds nest in and around cattails, in hayfields, brushy swamps, wetlands, and freshwater and saltwater marshes to name a few. 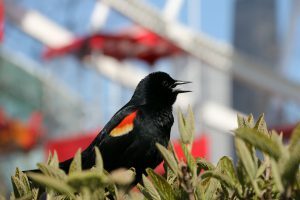 What Else Do Red-winged Blackbirds Attack? 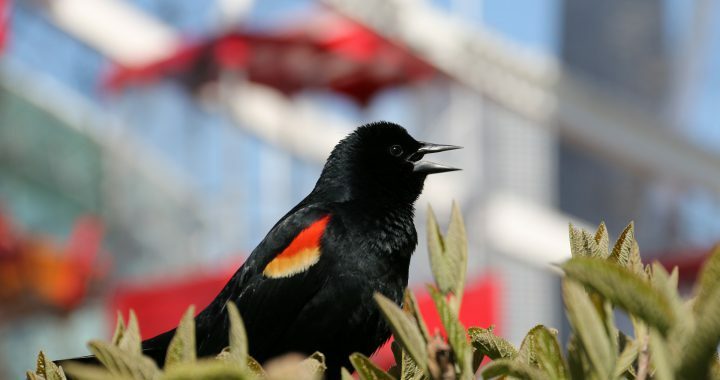 Red-winged Blackbirds are notorious for attacking bigger birds such as herons and hawks as mentioned earlier, but also vultures, eagles, bitterns, and egrets because they are also predators who will eat their nestlings. The blackbirds will fly at these larger birds pecking at their backs or even hitch a ride on them as they peck at them to get them away from their territory. They have also been known to attack humans as they try to keep them away from their babies. So if you are around a wetland or cattails that has Red-winged Blackbirds around, be alert for them during nesting season. Other predators of the Red-winged Blackbird are cats, foxes, and raccoons who are more than willing to eat the eggs or the nestlings if they can get to them. If the blackbirds aren’t afraid to attack humans I am sure that these mammals do not scare them. Red-winged Blackbirds are not the only birds that can be aggressive as they try to defend their territory. Most birds will have an aggression to another bird or mammal coming near their nesting site. A few in particular that I know of that have no problem attacking or dive-bombing humans are mockingbirds, blue jays, and swallows. Swallows in particular are very familiar to me for dive-bombing. 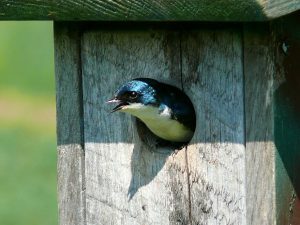 We had two pairs of Tree Swallows who had nestlings in two of our nesting boxes one spring. Each time that we would go into our backyard and nowhere near the nest boxes, the swallows would be out flying around us. If we did get anywhere close to the nest boxes, they would dive-bomb us and also my little Yorkie. They will not hurt you, they are just trying to keep you away from their babies. 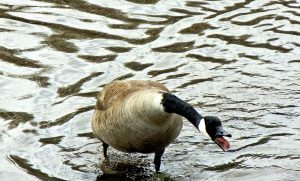 Canada Geese are also very notorious for their aggressive behavior to humans. If you get anywhere close to their nest or their babies they come charging at you. They on the other hand, may hurt you so it is good to stay away from mama and poppa and the babies. Whenever I encounter them in parking lots this time of year, as they seem to like to be, I steer clear of them. Another Personal Experience: At our pond currently are three sets of geese families. The pond is only about 20 feet from our patio and right up against our backyard where my Millie (Yorkie) likes to run or just lie in the sun. Before I even open the door I “read the room” as I call it, checking the area for the geese. Just last week one of the families had floated in while we were outside and Millie thought that she would try to scare them off. She has done this before with no problems, but this time there were babies involved and one of the parents came charging at her. Not good for my seven pound Yorkie! Consequently, Millie hesitates now before she goes outside until I tell her that she is safe. Both male and female Red-winged Blackbirds will defend their territory during breeding season like most birds. Breeding season for Red-winged Blackbirds is from spring to about mid summer. These blackbirds will go after hawks, herons, egrets, and even eagles as they try to protect their nestlings from being eaten by these predators. Red-winged Blackbirds will fly at their predator as they peck at them while on land or flying in the air. They have also been known to attack humans if they get to close to their nesting spots. The Red-winged Blackbird habitat is near cattails, marshy areas, and wetlands. So if you happen to be around such areas in spring through mid summer and you see them flying around as you go fishing, boating, or hiking, keep an eye out for them and be mindful of their nesting spots. Have you ever seen a Red-winged Blackbird attacking another bird? I would love to hear about it! Please feel free to make your comments below. Posted in Songbirds and tagged red-winged blackbirds. ← What Birds Eat Mosquitoes? Interesting story about the geese…I work in communications and there was a terminal located by a lakeshore that I had to get to..Sat down,opened it up and this huge honker charged and boinked my back..got me out of there too and as the work had to be completed,I thought of how I could resolve the situation without either of us getting hurt..Then I remember the saltine crackers that were part of my lunch sitting in the truck so I fetch em..Had to pay him and his mate two full packs in tribute for the invasion of their nesting place…after that..all was right in the world!.. Mike, that is not surprising. Geese are very aggressive when they are protecting their young. Good thing you had the crackers though to make good to the goose :-). I appreciate your comments, it is always interesting to hear other people’s experiences with nature and glad nobody got hurt.